For the filling: In a small dish, mix together the gelatin and cold water. Set aside. In a small heatproof bowl, whisk together the egg yolks and granulated sugar until thick and pale. In a saucepan over medium heat, combine the cream, milk and vanilla. Heat until boiling. Whisking continuously, pour about 1 cup of the hot liquid into the egg yolk mixture. Then, pour the egg yolk mixture back into the saucepan with the remaining hot milk, and continue to cook, stirring frequently, until the mixture is thick. Remove from heat, then whisk in the gelatin mixture, continuing to whisk until it is completely incorporated. Pour the mixture into a glass bowl and cover with plastic wrap. Refrigerate until it is completely chilled. For the cake: Preheat oven to 350 degrees, and grease and flour three 6-inch or two 8-inch round cake pans. In a large bowl, beat together the butter and sugar until fluffy. Add the eggs, sour cream and vanilla. Add the cake flour, baking powder and salt, and mix until combined. Pour in the heavy cream and continue to mix until smooth. Divide the batter evenly between the prepared pans, spreading the tops evenly. Bake the cakes until a cake tester inserted into the centers comes out clean, 30 to 35 minutes for 6-inch cakes, and 35 to 40 minutes for 8-inch cakes. Let cool completely in the pans on wire racks before removing. For the frosting: In a bowl, beat together the butter and powdered sugar until smooth. Add 1/2 cup of the strawberry preserves and salt, and beat until smooth. Add the heavy cream and beat until the mixture becomes light and fluffy. If desired, add a few drops of red food coloring to adjust the color of the frosting to your liking. Put the frosting in a piping bag with a plain tip. To assemble: Use a serrated knife to trim each cake layer so that it is flat. 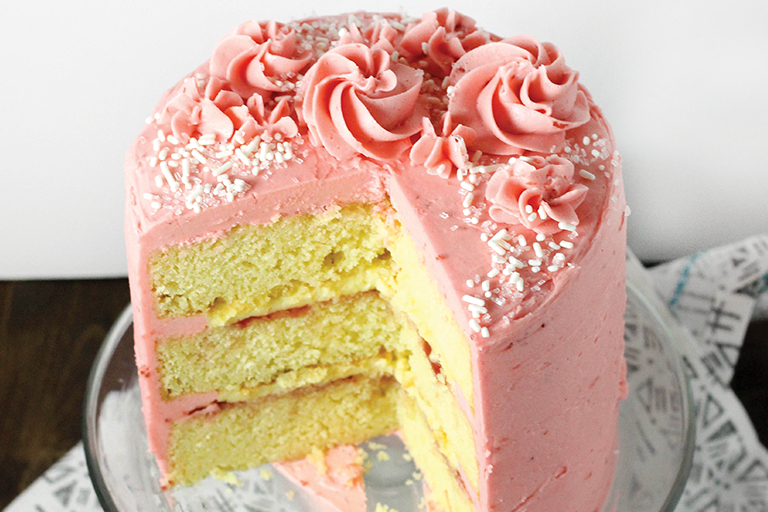 For a 3-layer cake, spread 2 tablespoons strawberry preserves in a thin, even layer on a cake layer, and then pipe a small ring of the pink frosting around the edges of the layer. Use a small offset spatula to spread the center with about 1/4 to 1/3 cup of the cream filling. Place a second cake layer on top of the filled first layer, lining up the edges. Repeat the filling steps as for the first layer. Top with the last layer, lining up the edges. For a 2-layer cake, follow the instructions for a 3-layer cake, using 1/4 cup preserves and 1/3 to 1/2 cup of the filling. When the layers are assembled, frost and decorate the cake as desired.